This tutorial was designed to help you with installation and configuration of OpenCV4Android SDK. This guide was written with MS Windows 7 in mind, though it should work with GNU Linux and Apple Mac OS as well. If you encounter any error after thoroughly following these steps, feel free to contact us via OpenCV4Android discussion group or OpenCV Q&A forum. We'll do our best to help you out. You may have used Tegra Android Development Pack (TADP) released by NVIDIA for Android development environment setup. Beside Android development tools the TADP 2.0 includes OpenCV4Android SDK, so it can be already installed in your system and you can skip to samples section of this tutorial. 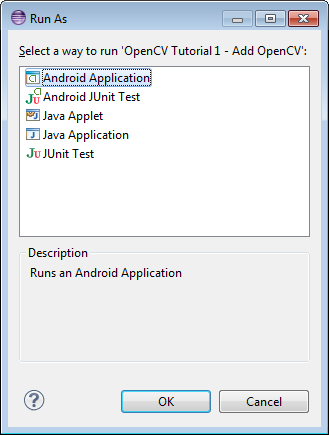 More details regarding TADP can be found in the Introduction into Android Development guide. OpenCV4Android SDK package enables development of Android applications with use of OpenCV library. sdk/etc folder contains Haar and LBP cascades distributed with OpenCV. apk folder contains Android packages that should be installed on the target Android device to enable OpenCV library access via OpenCV Manager API (see details below). On production devices that have access to Google Play Market (and Internet) these packages will be installed from Market on the first start of an application using OpenCV Manager API. But devkits without Market or Internet connection require this packages to be installed manually. Install the Manager.apk and optional binary_pack.apk if it needed. See Manager Selection for details. Installation from Internet is the preferable way since OpenCV team may publish updated versions of this packages on the Market. samples folder contains sample applications projects and their prebuilt packages (APK). Import them into Eclipse workspace (like described below) and browse the code to learn possible ways of OpenCV use on Android. doc folder contains various OpenCV documentation in PDF format. It's also available online at http://docs.opencv.org. The most recent docs (nightly build) are at http://docs.opencv.org/2.4. Generally, it's more up-to-date, but can refer to not-yet-released functionality. Go to the OpenCV download page on SourceForge and download the latest available version. Currently it's OpenCV-2.4.9-android-sdk.zip. 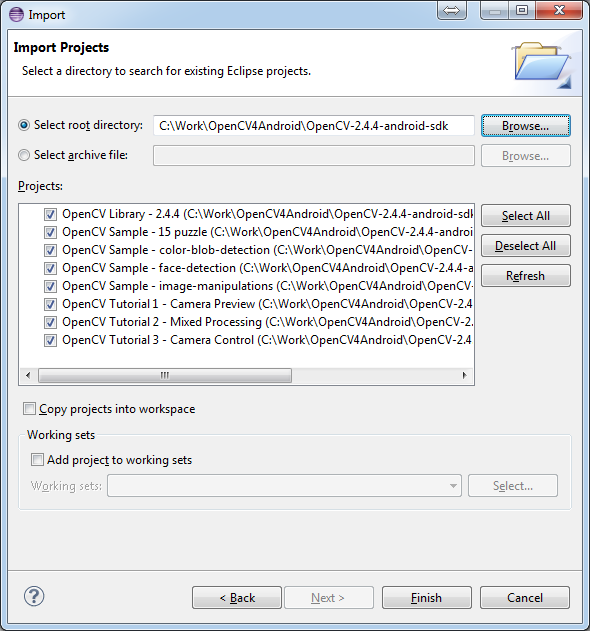 Create a new folder for Android with OpenCV development. For this tutorial we have unpacked OpenCV SDK to the C:\Work\OpenCV4Android\ directory. Better to use a path without spaces in it. Otherwise you may have problems with ndk-build. 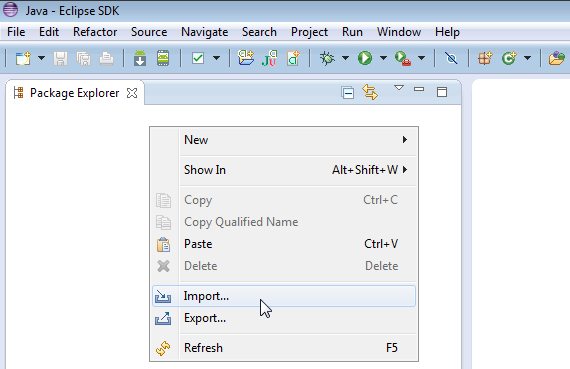 Unpack the SDK archive into the chosen directory. Start Eclipse and choose your workspace location. Import OpenCV library and samples into workspace. OpenCV library is packed as a ready-for-use Android Library Project. You can simply reference it in your projects. Click Finish button to complete the import operation. OpenCV samples are indeed dependent on OpenCV library project so don't forget to import it to your workspace as well. After clicking Finish button Eclipse will load all selected projects into workspace, and you have to wait some time while it is building OpenCV samples. Just give a minute to Eclipse to complete initialization. At this point you should be able to build and run the samples. 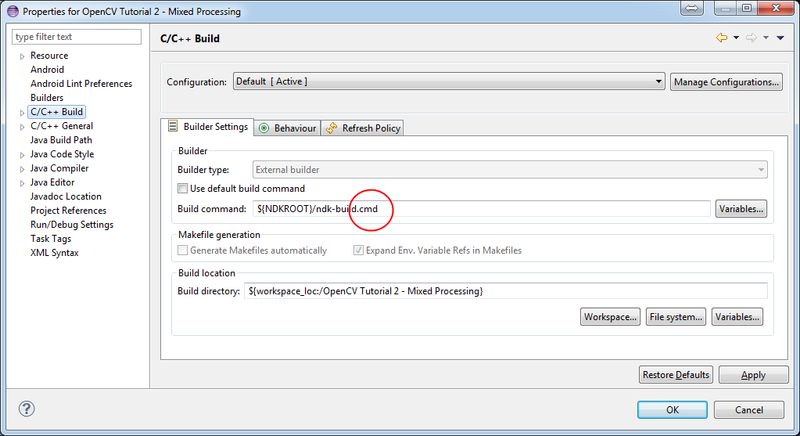 Keep in mind, that face-detection and Tutorial 2 - Mixed Processing include some native code and require Android NDK and NDK/CDT plugin for Eclipse to build working applications. If you haven't installed these tools, see the corresponding section of Introduction into Android Development. Please consider that some samples use Android Java Camera API, which is accessible with an AVD. Recent *Android SDK tools, revision 19+* can run ARM v7a OS images but they available not for all Android versions. Connect your device with adb tool from Android SDK or create an emulator with camera support. See Managing Virtual Devices document for help with Android Emulator. See Using Hardware Devices for help with real devices (not emulators). Select project you want to start in Package Explorer and just press Ctrl + F11 or select option Run –> Run from the main menu, or click Run button on the toolbar. Select the Android Application option and click OK button. Eclipse will install and run the sample. To get rid of the message you will need to install OpenCV Manager and the appropriate OpenCV binary pack. Simply tap Yes if you have Google Play Market installed on your device/emulator. It will redirect you to the corresponding page on Google Play Market. If you have no access to the Market, which is often the case with emulators - you will need to install the packages from OpenCV4Android SDK folder manually. See Manager Selection for details. x86 is for Intel x86 CPUs with Android API 9+. If you're using an AVD emulator, go Window > AVD Manager to see the list of availible devices. 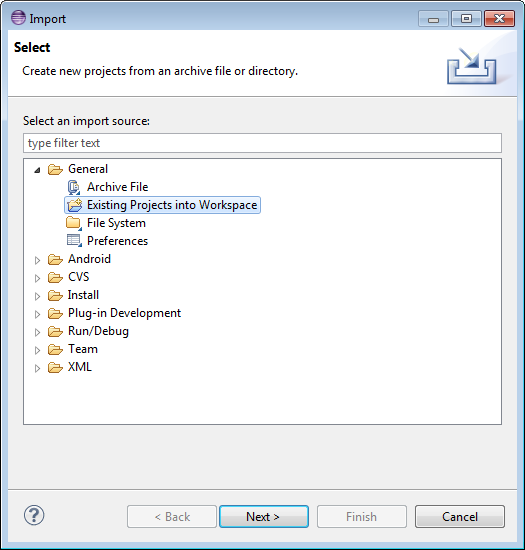 Click Edit in the context menu of the selected device. In the window, which then pop-ups, find the CPU field. You may also see section Manager Selection for details. When done, you will be able to run OpenCV samples on your device/emulator seamlessly. 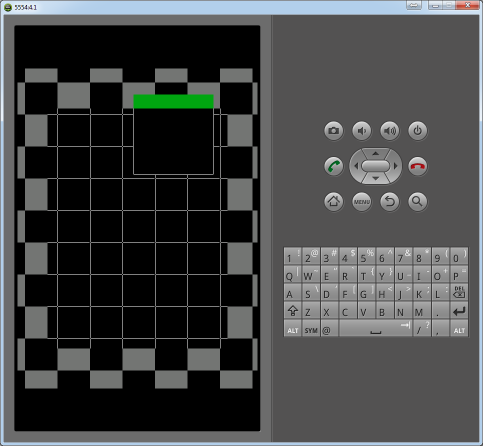 Here is Sample - image-manipulations sample, running on top of stock camera-preview of the emulator. Now, when you have your instance of OpenCV4Adroid SDK set up and configured, you may want to proceed to using OpenCV in your own application. You can learn how to do that in a separate Android Development with OpenCV tutorial.